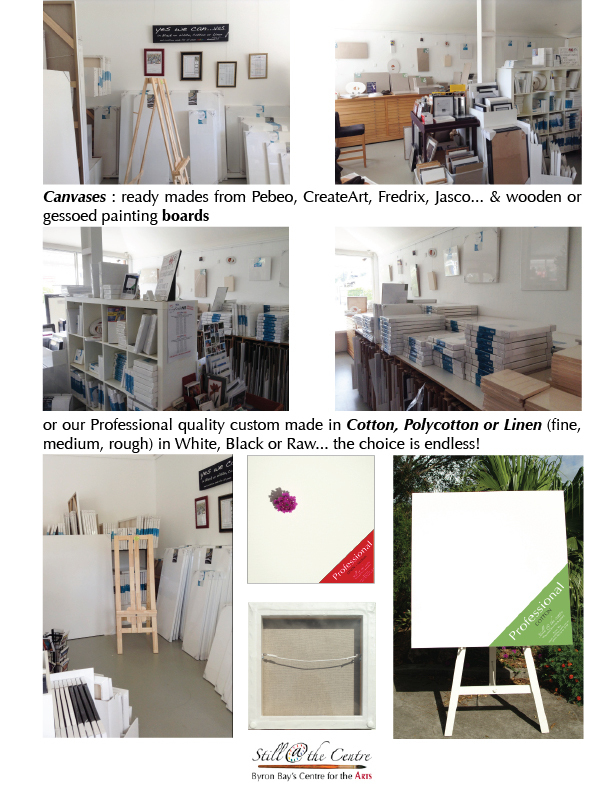 a place in which to browse among over a 100 different sizes of ready-made canvases or have one made just for you! As far as quality is concerned don’t just take our word for it… first, look at the back! We design our very own bracing and stretcher bars. Both are high quality pine with all angles rounded, as no edges means no more marks on the front of the canvas. And, when designing our stretcher bars sloped, we’ve made sure the angle was right to get rid of those ridge marks all along the sides of your canvas. We also made sure there would be strong bracing to support the bigger frames on the corners, across or crisscrossing depending on the size (cf price list for designs). The finishing is also impeccable: the staples are taped over and canvases are ready to hang (both ways!). And now the front… but do you want to go for the white or the blue flower? Our COTTON canvas is a 12oz, 100% cotton. It’s heavyweight (more like denim) and pleasantly textured, displaying small cotton seeds on the surface –a sure sign of a good quality canvas. Also, our priming is bright white and free from any noxious or toxic substances. 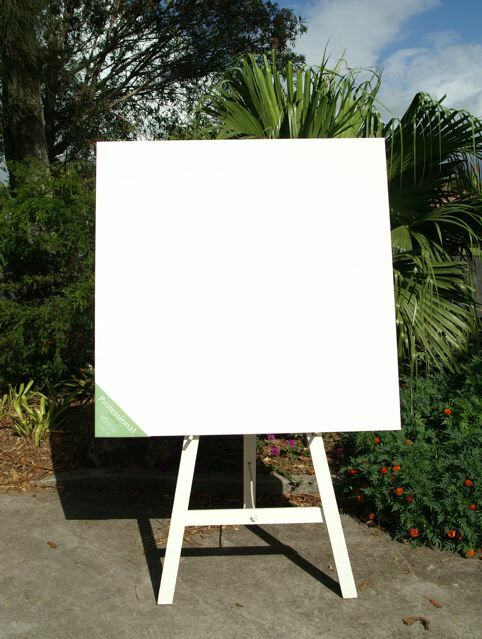 If good quality cotton canvas is great to paint on… just wait until you try LINEN. (But watch out because many artists tell us that when they made the switch, their painting got so much better that there was no going back!) Yes, it’s more expensive than cotton yet its a strong and durable cloth that can absorb up to 20% of its weight in moisture before it feels damp so you can “play” with your canvas that has more “give”. 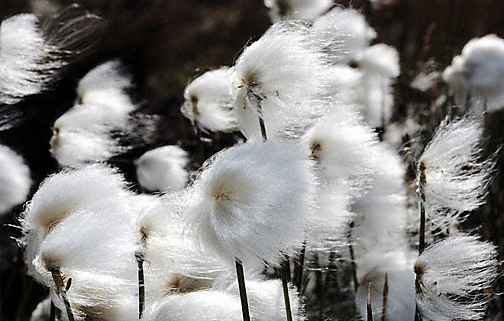 The source of linen fibres is the flax plant, whose fibres are stronger than any other natural fibre. These fibres are round, not flat like cotton, which gives linen fabrics their irregular texture. Chemically, the fibres are 70 to 80 per cent cellulose and contain the same oil that is found in the plant’s seeds, that is linseed oil. The natural content of linseed oil preserves the fibres and keeps them flexible. The rope-like quality of the linen fibres produces an irregular texture which is especially ideal for figurative painting because of the sense of depth it gives to the surface. Our linen canvas has triple priming on a foundation sealer, it is traditionally woven to the highest quality, it’s acid-free and suitable for all techniques. POLYCOTTON is our new blend and the professional polycotton 12oz artists canvas we chose is made to highest quality, milled from 52% Polyester & 48% Cotton. This artist canvas is tightly woven which produces a fantastic painting surface, smooth, great for detailed work, resin work and drum-tight stretching that holds! Apparently it’s also a lot less prone to moulding (a nice plus around here!) Just if you were wondering why not full polyester, it’s because polycotton is far better to stretch and creates much better elasticity in the fabric having the blend of the two materials, helping it hold its shape and staying tight once stretched. Polyester although smooth is quite stiff and does not stretch as well as poly cotton. And in between the back and the front? Well… that’s where our “stretched @ the centre” promise becomes a reality. 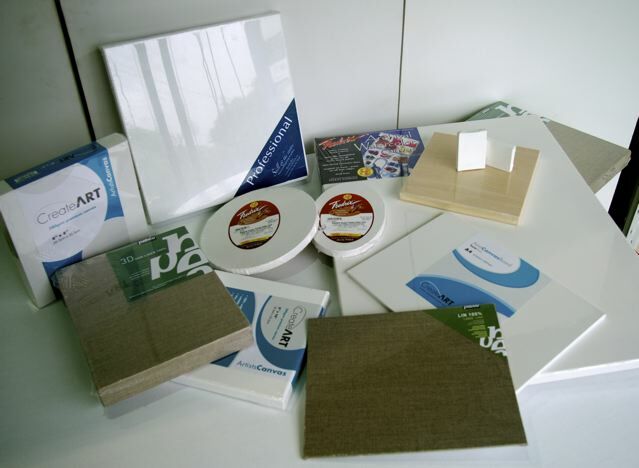 Firstly because all our frames are hand-made in Still @ the centre’s workshop, but also because, whatever PROFESSIONAL canvas you choose, we’ll stretch it tight on our frames so that your canvas will remain firmly stretched… even in the centre! FREDRIX: We stock a whole range of their oval and round canvases and their speciality, watercolour canvas, by the roll or on stretchers. Please note that we do try and keep our prices up to date on this website, but cannot guarantee that they always are valid as our suppliers alter their prices without notice too! If you want to be sure of our current price, please contact us.